Regular exercise to restore your knee mobility and strength is necessary. For the most part, this can be carried out at home. Your orthopaedic surgeon may recommend that you exercise approximately 20 to 30 minutes two or three times a day. You also may be advised to engage in a walking program. Your orthopaedic surgeon may suggest some of the following exercises. The following guide can help you better understand your exercise or activity program that may be supervised by a therapist at the direction of your orthopaedic surgeon. As you increase the intensity of your exercise program, you may experience temporary set backs. If your knee swells or hurts after a particular exercise activity, you should lessen or stop the activity until you feel better. You should Rest, Ice, Compress (with an elastic bandage), and Elevate your knee (R.I.C.E.). Contact your orthopaedic surgeon if the symptoms persist. Hamstring Contraction – Repeat 10 times. No movement should occur in this exercise. Lie or sit with your knees bent to about 10 degrees. Pull your heel into the floor, tightening the muscles on the back of your thigh. Hold 5 seconds, then relax. Quadriceps Contraction – Repeat 10 times. Lie on stomach with a towel roll under the ankle of your operated knee. Push ankle down into the towel roll. Your leg should straighten as much as possible. Hold for 5 seconds. Relax. Straight Leg Raises – Repeat 10 times. Lie on your back, with uninvolved knee bent, straighten your involved knee. Slowly lift about 6 inches and hold for 5 seconds. Continue lifting in 6-inch increments, hold each time. Reverse the procedure, and return to the starting position. Buttock Tucks – Repeat 10 times. While lying down on your back, tighten your buttock muscles. Hold tightly for 5 seconds. Straight Leg Raises, Standing – Repeat 10 times. Support yourself, if necessary, and slowly lift your leg forward keeping your knee straight. Return to the starting position. Terminal Knee Extension, Supine – Repeat 10 times. Lie on your back with a towel roll under your knee. Straighten your knee (still supported by the roll) and hold 5 seconds. Slowly return to the starting position. Straight Leg Raises – Perform 5 sets of 10 repetitions. Lie on your back, with your uninvolved knee bent. Straighten your other knee with a quadriceps muscle contraction. Now, slowly raise your leg until your foot is about 12 inches from the floor. Slowly lower it to the floor and relax. Partial Squat, with Chair – Repeat 10 times. Hold onto a sturdy chair or counter with your feet 6-12 inches from the chair or counter. Do not bend all the way down. DO NOT go any lower than 90 degrees. Keep back straight. Hold for 5-10 seconds. Slowly come back up. Relax. Quadriceps Stretch, Standing – Repeat 10 times. Standing with the involved knee bent, gently pull heel toward buttocks, feeling a stretch in the front of the leg. Hold for 5 seconds. Knee Bend, Partial, Single Leg – Repeat 10 times. Step-ups, Forward – Repeat 10 times. Step forward up onto a 6-inch high stool, leading with your involved leg. Step down, returning to the starting position. Increase the height of the platform as strength increases. Step-ups, Lateral – Repeat 10 times. Step up onto a 6-inch high stool, leading with your involved leg. Step down, returning to the starting position. Increase the height of the platform as strength increases. Terminal Knee Extension, Sitting – Repeat 10 times. While sitting in a chair, support your involved heel on a stool. Now straighten your knee, hold 5 seconds, and slowly return to the starting position. Hamstring Stretch, Supine – Repeat 10 times. Lie on your back. Bend your hip, grasping your thigh just above the knee. 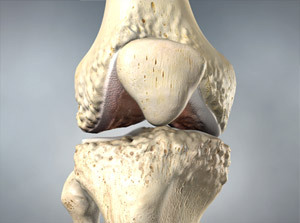 Slowly straighten your knee until you feel the tightness behind your knee. Hold for 5 seconds. Relax. Hamstring Stretch, Supine at Wall – Repeat 10 times. Lie next to a doorway with one leg extended. Place your heel against the wall. The closer you are to the wall, the more intense the stretch. With your knee bent, move your hips toward the wall. Now begin to straighten your knee. When you feel the tightness behind your knee, hold for 5 seconds. Relax. Exercise Bike – Start pedaling for 10 minutes a day. Increase the duration by one minute a day until you are pedaling 20 minutes a day. An excellent physical exercise activity in the middle stages of your recovery from surgery (after 2 weeks). 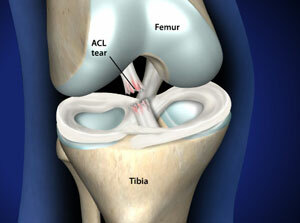 Running should be avoided until 6 to 8 weeks because of the impact and shock forces transmitted to your knee. Both walking and running activities should be gradually phased into your exercise program.